Estate (private use): approx. 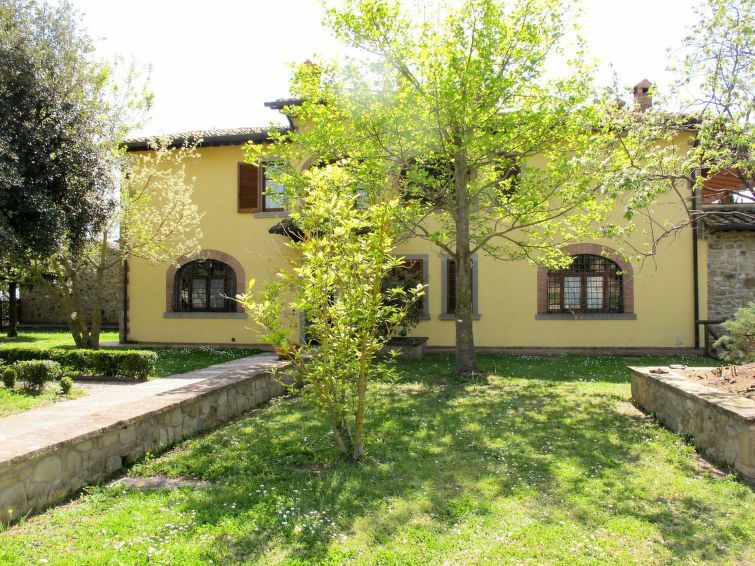 600 m² (whole estate 2.2 ha) , closed plot (fence, entrance gate), trees, with plants, garden, lawn. Garden maintenance by the owner 7 time/s per week. Owner lives on the property. On the neighbouring estate dogs. Outdoor facilities(private use): reserved open space (wood pavillon), balcony 4 m² (roofed), balcony 4 m² (roofed), furnishing provided (1 garden table, 2 chairs), lounge furniture (permanently mounted), brick barbecue. Pool (private use): 12.0 x 5.0 m, 04.05.19-28.09.19, pool maintenance by the owner 7 time(s) per week. Pool area: lawn for sunbathing, deck chairs, 6 sun loungers, 2 sunshades, external shower. Fishing: good fishing possibilities, in the lake in approx. 500 m, fishing licence provided by the owner (payment). Center Monte San Savino in approx. 4 km. Civitella Val di Chiana in approx. 5 km. Arezzo in approx. 14 km. Next shopping possibility (Albergo) in approx. 600 m.
Train station Albergo in approx. 1 km. Airport Firenze in approx. 100 km. Lake in approx. 500 m.
semi-detached house, 5 - 6 people, 4 room/s, 3 bedroom/s, 3 bathroom/s, approx. 100 m², 2 floor/s, renovated. Furnishing: comfortable, pleasant, cotto floor, parquet floor. Living room(ground floor): 1 x sofa, 2 x armchair, fireplace. Kitchen: open to the living room (ground floor). Kitchen/ cooking equipment: 4 gas rings, oven, microwave oven, dish-washer, combination fridge-freezer, coffee machine, water boiler, toaster. Bedroom 1(floor 1): queen-size bed (1.60 m wide), exit to balcony. Additional information: direct access to sanitary no 2. Bedroom 2(floor 1): double bed (1.60 m wide). Bedroom 3(floor 1): 1 x single bed (0.80 m wide), 1 x sofa bed, exit to balcony. Sanitary 3(floor 1): bath (jacuzzi), WC. Local service charges € 12 per person and stay (depending on occupancy). Heating if required, € 10/​day. Linen/towels available. Change of bed linen/towels, € 5 per person. Deposit € 200 (in cash). Cot free of charge (on order). High chair free of charge (on request). Pet 1 pet allowed, € 35 per week (please advise prior to arrival; additional animals on request only).